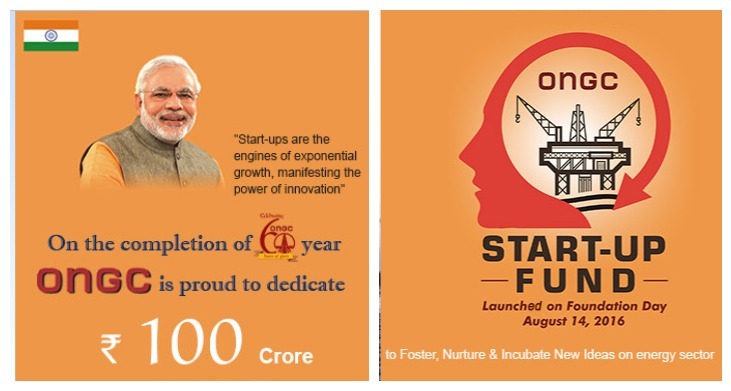 On completing 60 years of existence, State-owned company Oil and Natural Gas Corporation has announced a Rs 100-crore ($15 million) startup fund. The objective is to foster, nurture and incubate new ideas related to the energy sector. The company has made a special website for startups to apply for the funds. Under this initiative, ONGC would provide the entire support chain for startups, including seed capital, hand-holding, mentoring market linkage and follow-ups to increase the contribution of fresh implementable ideas in the sector. Dinesh K Sarraf, CMD, ONGC said this initiative would promote entrepreneurship among the younger Indians by creating an ecosystem that is conducive for the growth of startups in this sector, which has a huge potential for technology-enabled ideas. ONGC has its headquarters in Dehradun. It is India’s largest producer of crude oil and natural gas, accounting for about 70 per cent of total production and ranks 17th among global energy majors. It is one of the highest profit-making and dividend-paying public enterprises in India with over 33,000 employees. The involvement of public sector companies in encouraging startups in India is a welcome sign. Earlier this year, as part of the government’s Startup India programme’s emphasis on innovation in public sector, Indian Railways had announced a Rs 50 crore innovation fund to open incubators, where railway employees and startups could solve problems relevant to the organisation. It is hoped that more companies would come forward in building and nurturing the startup movement in India.